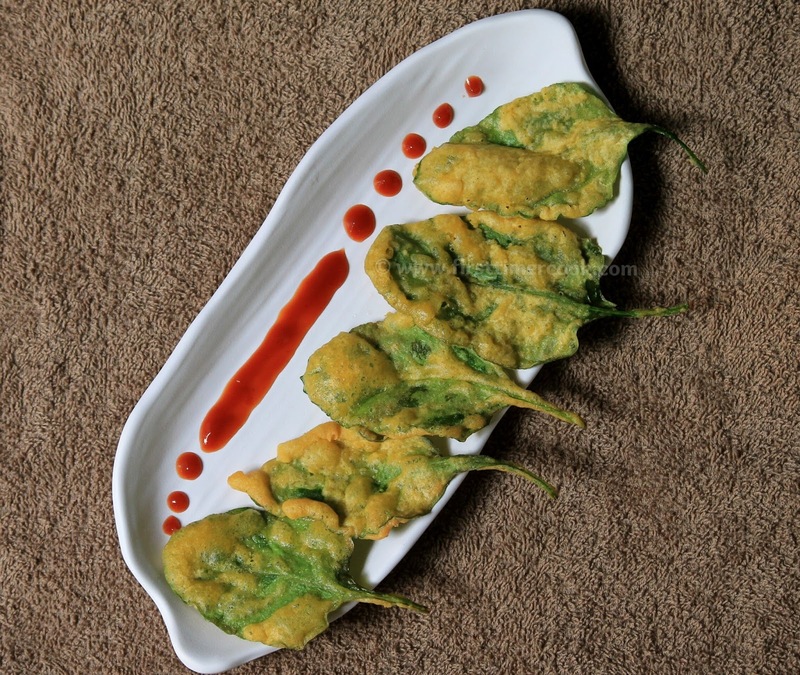 Spinach fritters or palak pakora or palak bhajia - a vegan crispy snack prepared with spinach leaves. This cold weather is the perfect time to make these fritters. 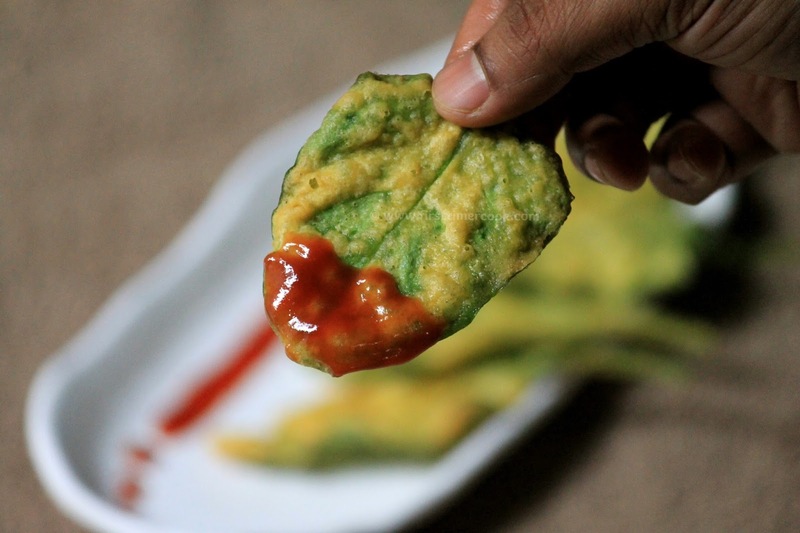 If your kids are annoying to have palak, then I can assure you that these spinach fritters'll be loved by them. The main ingredients in these fritters are besan (chickpea flour) and spinach (palak). Sometimes we need something crunchy to grab as well as that should be prepared quickly and easily. So these spinach fritters are perfect match and a must try recipe since it is easy, quick and a great snack food. All we need to be handy is some spinach leaves which should be fresh, a batter of besan for dipping the spinach leaves and oil for deep frying. In the batter, both baking soda as well as rice flour is added. The baking soda provides a softness to the fritters from inside where as the rice flour provides a crispiness to the fritters from outside. So lets go in details of preparation of these crispy spinach fritters which'll be a great accompaniment to a hot cup of tea in this cold weather evening. Rinse well all the spinach leaves. Pat dry and keep aside. In a mixing bowl, take besan. Add rice flour, salt and baking soda. Mix well. Then add red chili powder, turmeric powder, ajwain and mix again. Next gradually add water in order to get a batter of neither too thick nor too thin consistency. Now heat oil in a deep pan on medium heat. Then first hold the stalk of a spinach leaf, dip into the batter, coat it evenly and drop gently into the hot oil. Deep fry until crisp and golden. 3-4 no. of spinach leaves can be deep fried in a single batch. Take out the fritters and place on paper towel to remove excess oil. Repeat the same method for rest of the leaves. 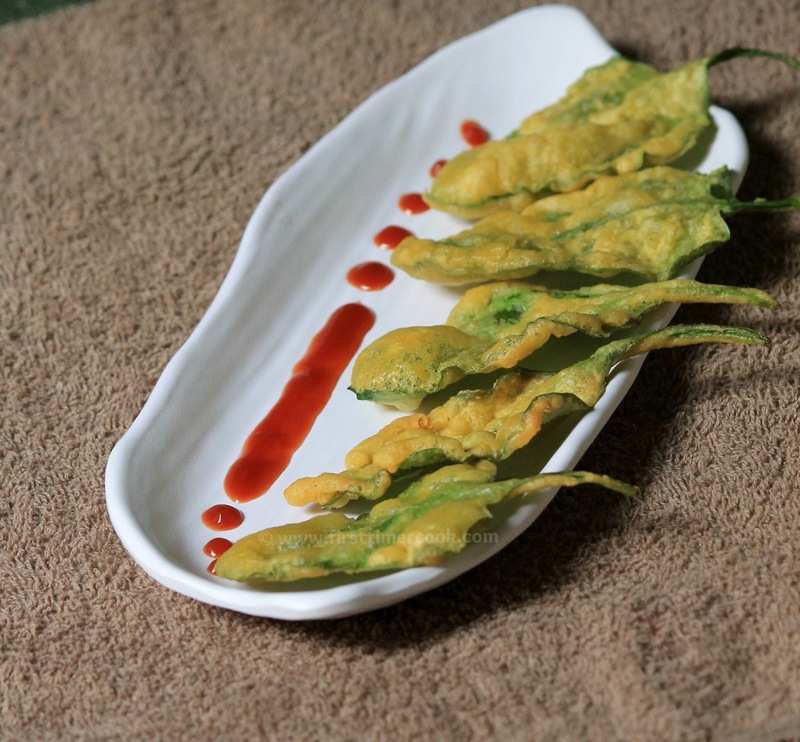 Serve these hot spinach fritters with tomato ketchup or tamarind chutney or a cup of tea ! Oil for deep frying should be medium hot. Rice flour is added to give a crispness to the fritters.